This is a must do for the new leader. The route has 4 bolts. There is a horizontal crack 15 feet from the ground that will take a .75 cam if you feel uncomfortable climbing to the first bolt. The crux comes on the top half of the climb. Once you hit a large ledge you clip the third bolt and do a side pull on to a large foot hold. The climbing is good and straight forward. This is a fun quality climb. To get to The Tower from the ramp walk south on the loop trail for 125 yards you will see the tower with four bolts. 4 quick draws medium size cam optional. Bolt anchor and rap station at top of tower. Dave on the Tower. Jan 2019. A hot afternoon on the tower. Dave LaSorte at the crux section. Moving closer to the bolt. This is NOT a Sport Climb. This is a mixed (bolt & gear) climb for 5.7-8 leaders. New leaders, especially sport leaders, should think twice before running this climb out on only bolts. If you're an experienced 5.9 leader, go for it. The 4 bolts were placed in typical Mission Gorge style so that up to 4 gear placements could also be made, depending on your comfort level. 1. 1st piece - low down in first 10 ft, optional. 2. 2nd piece - in horizontal just before first bolt, strongly recommended. 3. 3rd piece - under small overhang just before third bolt, optional large cam. clipping bolt is easy, but serious fall if you slip. This climb was quite fun and felt safe to me. The climb came down to one move with good holds and a little friction. 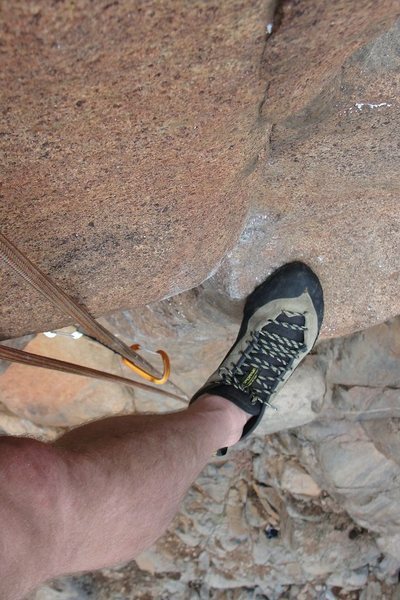 here are some long arm pics of me solo leading this gem..
just pass the crux.. having fun! looking up after the climb try to decide if I should do it again.. I have brought two friends here for their first lead. It a good lead for anyone climbing comfortably at the grade. While one could place gear I don't see any need to so, the first 3/4 of the climb is only 5.5 or 5.6 and is not runout IMO. 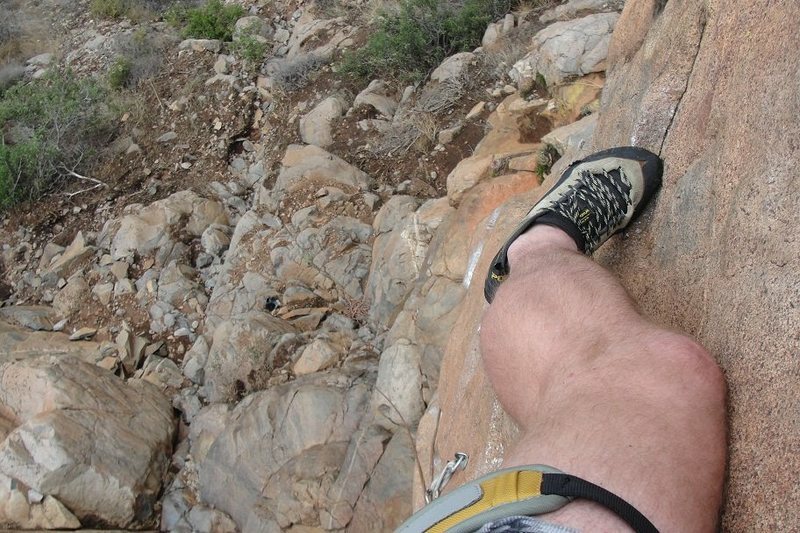 The crux move is above a ledge, so it's not ideal territory for a fall. 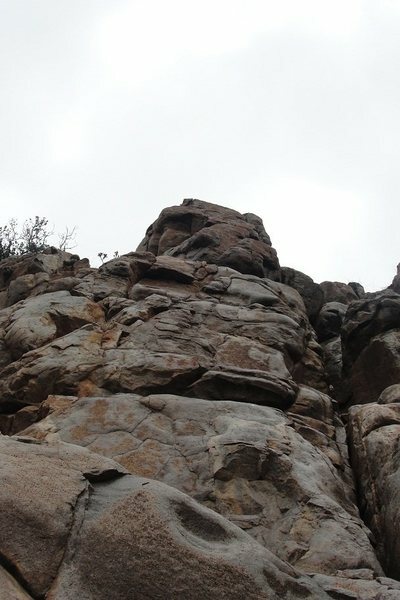 If 5.7 is near your limit this isn't the route for you (but if 5.7 is near your limit you should top rope more before you worry about leading anyway).